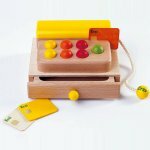 BabyNaturopathics.com - Erzi Little Cash Desk Pretend Play Toy Register - Baby Naturopathics Inc.
You can earn 62 bnReward Points on this product! This little�wooden cash register gives kids two payment options: cash or credit card. The seven colorful keys squeak when you give them a tap. Includes three wooden credit cards, but does not include play money. Erzi Little Cash Desk is designed and crafted in Germany. Erzi Play Money is sold separately.